On The Road Throughout Ayrshire Eat & Train Season Three Already! Arts at The Heart Jasmine Bater’s Award In Memoriam of the Fallen Our CEO Fiona McKenzie Shortlisted for National Award Massive thanks to the West Kilbride Boys Brigade It’s all about #fitfunfolk Get behind our Centrestage Kiltwalk Ambassadors Meet The Kiltwalk 2019 Ambassadors Experience Centrestage It was all about coming together at Centrestage Last Christmas Family and Friends Hub at HMP, Kilmarnock gets Centrestaged Keeping you updated on Centrestage Village It's all about our folk! #payitforward donation that you can give. This will go straight back into supporting our projects across Centrestage! Hello It’s beginning to look a lot like….Springtime! Welcome to our 7th edition of ‘Your Centrestage’! The nights are starting to get a little brighter and we have already had the most wonderful start to the year, welcoming new #oneteam members and meeting more folks across all our activities. At this same point last year, we had just announced that we were about to embark on a journey that would culminate in Kilmarn ock Academy becoming our future home. It is with great excitement and gratitude that we can announce that the process was completed in Fe bruary and that groundworks will begin in April, making this beautiful and historic site fully accessible for the entire community to enjoy f rom early 2020, making the Centrestage Village a reality; a place to bring people together, creating connections and building relationships; a village with the arts at the heart, bringing folks to the centre of Kilmarnock to be part of our wonderful community. We will be keeping everyone updated on all the news and we cannot wait to share the story as it unfolds. Our 2019 season has seen so many wonderful productions already, from our “Nashville New Year” and ever popular “Richt Guid Nicht”, more wonderful and original dance productions including “Stepford Wives”,“ The Prime of Miss Jean Brodie” and “Edelweiss Pirates” and, for the very first time, our Gospel and Soul choir gave a joint performance with the Ayrshire Fiddle Orchestra at Kilmarnock ’s Grand Hall. These have all been very special nights and, as we look forward to Summer season, our three 8-11yrs Musical Theatre companies are getting ready to journey to Agrabah as they tell the classic story of Aladdin. Don’t miss out. There may be magic…! And believe it or not, it’s time to get ready for Kiltwalk 2019! Following last year’s incredible events, we are aiming for this years’ walk to be even more fun than before! The 2018 walks made it possible for us to purchase our very own community buses to bring folks of all ages together, reducing loneliness and building connections ac ross Ayrshire look out for photos coming very soon as they are just getting a wee facelift at present! We would love it if you could get involved in any way this year and if you are unable to walk for us, there are so many ways you can help, from sponsoring our Ambassadors representing activities from Aspire to Musical Generations; sponsoring entry fees for folks across the community who may struggle to pay it; helping sponsor transport to take our folks there and back… So many ways to help and every single penny makes a difference and, for every single £1 raised, The Hunter Foundation donates an incredible further 40%. If you’re feeling keen in 2019, please contact frank.gormanley@centrestagemt.org.uk or call 01563 551505 and we will be delighted to tell you more! What a year this is going to be. We can’t wait to see you…! There’s a New Village in Town…! Connect with me on Twitter @fionacs Your Centrestage | 03.
dressed up in their cowboy boots and Stetsons as well. down a storm with everyone! “I had a BBQ beef brisket sandwich that was delivered to my seat with the ‘Text The Bar’ service, it was absolutely phenomenal!” Kirsty told us. Country Roads’ that rocked the finale. A RICHT GUID NICHT INDEED! The evening was brought to a close by a harmonious rendition of ‘Auld Lang Syne’ during which our performers and audience linked arms in a united celebration of Rabbie. 2020 already. Haste Ye Back…! production told the story of how teacher Miss Jean Brodie slowly becomes more manipulative towards the favoured girls in her class, nicknamed the ‘Brodie Set’, and becomes entangled in a complicated love triangle with two other teachers. “The performance was equal parts funny as it was moving, the girls were truly fantastic. I think this is the best show I’ve seen this year!” Maureen told us on leaving. The cast did a wonderful job of capturing the complex and different characters of each member of the Brodie Set and special mention must go to Lauryn Cameron who perfectly portrayed the title role. Every performer gave their individual best to create two unique performances, showcasing these talented teenagers and making all of their hard work worthwhile. Well done to everyone involved! Look out for more of our Musical Theatre shows! Melanie told us; “I loved every minute of The Stepford Wives! It was so cleverly done, and both me and my friends found it as hilarious as it was breath-taking!” A massive well done to both our performers and their director and choreographer, Marlisa Ross, for all the effort and talent they put into giving us the most spectacular dance production! woman who moves to Stepford with her husband, where she suspects something isn’t quite right with the women of Stepford’s behavior and tries to uncover the strange little town’s secret. This was the first dance theatre performance staged by our Adult Dance Theatre class which meets on Wednesday evenings at 6pm and was an incredible achievement for all concerned. Thanks must also go to Nina Russell and her Enterprise team for creating the beautiful costumes and to Hazel Cuthbert for her time and expertise in styling the wigs and hairdos so perfectly. stitches, the whole performance was so well thought out! Both Actors companies did incredibly well and put on such spectacular performances that the night was sealed with uproarious applause from the audience. We look forward to our CS Actors upcoming performance of “Dad’s Army” with some very special surprises too. THE AYRSHIRE FIDDLE ORCHESTRA TAKES CENTRESTAGE! Boat Song” and “Amazing Grace”. To round off the evening, the company performed “Oh Happy Day” which has become known as a staple of Gospel & Soul Choir’s fun-filled Friday evenings. such incredibly talented performers and their director, Marlisa Ross. Visit our Centrestage Café/ Bar and catch up with your family and friends to enjoy something from our Seasonal Menu, Grab and Go fridge or enjoy a hot drink with a choice of delicious sweets treats to choose from. Our little VIP’s now have their own menu at Centrestage - they can even colour it in! Not only that, they’ll get a free Centrestage balloon, sticker and they can help themselves to something from our fruit bowl. We can’t wait to welcome you very soon! surplus food by our incredible team of chefs. so much more right into the heart of communities. Pop in anytime for some fun, food and folk! EAT & TRAIN SEASON ALREADY! 66 people, 9 areas, 12 weeks, 1 chef and 9 mentors, and weâ&#x20AC;&#x2122;re ready to make this happen! January saw our award winning Eat And Train (EAT) project take to the road again for its next 12 week session and participants are enjoying learning how to prepare healthy nutritional meals on a budget from our award winning chefs, Mich Brooks and Craig Ferrell. The previous sessions have already seen significant success with participants of all ages progressing to volunteering, work placements, college and employment. But most importantly, everyone is enjoying cooking at home and enjoying the wonderful recipes created in the classes with their families. Friendships have been made through the course and candidates are becoming more and more confident as the weeks progress. We are delighted that previous candidates are now mentoring our courses and encouraging the new ones on their journey of success! artist’s works are hanging in the National Portrait Gallery to be viewed and enjoyed by their thousands of international visitors. We also broaden our horizons by frequently visiting Art Galleries across Scotland where our young folks gain new perspectives through wider viewing of contemporary art, giving them further inspiration for their own projects. Watch this space as we work on some exciting artistic creations for Centrestage Village and look out for future ‘Art at the Heart’ sessions delivered from Connect House. Gallery to take place in the Burns Mall last year. learners with additional support needs and helped them gain SQA qualifications. But perhaps the most influential of her achievements has been the setting up of a ‘Safe Place’ to help support victims of abuse and discrimination. very bright future for Jasmine Bater”. now rest in permanent display in The Gathering at the heart of the old Academy building. We hope that these will be read and reflected on by grateful generations to come. taking on the role of postmen throughout the town. Cleary many cards were posted! Communities as one of their three selected charities. across their communities and we are delighted to see Fiona recognised in this category. Fiona said, “It’s a real privilege to be shortlisted for the award. Building community is at the heart of all we work to achieve at Centrestage and I am so proud of everyone across our #oneteam who goes above and beyond to make so much happen every single day.” The special night provides the platform to showcase the amazing achievements of women across Scotland, from sporting and business awards to caring for the environment. The event will celebrate remarkable women from all walks of life, celebrating their achievements. We congratulate everyone recognised and hope they enjoy a wonderful evening of celebration. scheduled for Sunday 7th April, which this time will last for 6 miles! We can’t wait to welcome even more of you that day, everyone is welcome, so bring your dogs, prams and grannies…! And there is still plenty of time to get involved in our great Kiltwalk adventure. Ask any of the team for details of how to join our community of walkers on the day or email kim.black@centrestagemt.org.uk. Foundation, our overall total was £25,281. massive milestone in the legacy project. to have lots of prams and wheelchairs wandering with us! our activites will take on either The Wee Wander, The Big Stroll or The Mighty Stride on Sunday the 28th of April in Glasgow to help raise funds for their special cause. 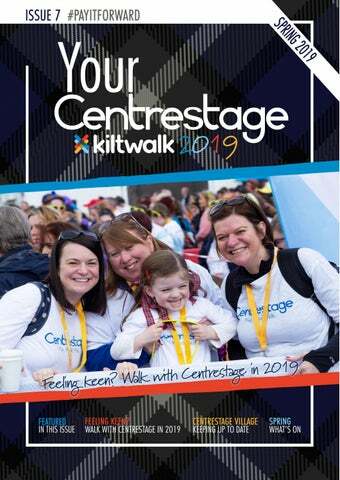 Meet our Kiltwalk Ambassadors! Your Centrestage | 25.
www.centrestagemt.org.uk Your Centrestage | 26. *Winner will be selected at random. Only take part if you’re available to join us at the advertised production. December across Ayrshire communities delivering our Dignified Food Provision, ensuring that folks that needed it the most had food provision to enjoy at Christmas. Here are some of our best photos capturing the season! FAMILY AND FRIENDS HUB AT HMP KILMARNOCK GETS CENTRESTAGED Centrestage has been a part of HMP Kilmarnock since 2011 and, since the early days where music was the only offering, our Catalyst support is now provided inside the establishment with further advice and support provided in communities across Ayrshire as well as in the Catalyst Hub in John Finnie Street. We were delighted to be awarded the opportunity to provide the service supporting families and friends visiting the establishment and the Family and Friends Hub is now open, creating a warm and supportive environment for those visiting family and friends, especially first time visitors who are unsure of prison procedures. The Hub also provides light refreshments including sandwiches, fresh fruit, tea, coffee and juice and the layout has been designed to ensure that children can have access to indoor and outdoor play facilities whilst visiting. to the enhancement of Kilmarnock’s Cultural Quarter. Transfer in Scotland to date. regeneration, and our local economy as a whole. hard work to make this transfer happen. could do something with my life. with difficult upbringings to be confident individuals. IT'S ALL ABOUT OUR FOLK! 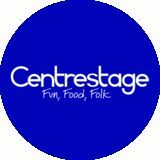 'Your Centrestage' takes the opportunity each edition to introduce you to some of the wonderful folk across the charity, from staff and volunteers to our communities that engage with us across all our projects everyday. This months it's all about Taylor, Noelle, Afton and Hugh... enjoy their stories! Remember if you have a Centrestage story to share, why not get in touch with our team and you could be featured in our Summer 'Your Centrestage'. I came along with my sister to Musical Generations. I have volunteered here for three and a half years and love everything about it. When Elaine offered me a volunteer position, I grabbed the opportunity with both hands. The people here make a difference to everyone who comes along and I always try to raise money on behalf of Centrestage. Even putting in donations where I can. Look out for our Summer issue of Your Centrestage with full Aladdin Jr. write up! Seymour and his man eating plant. Little Shop of Horrors is definitely one to see and features a fantastic hit score by composer Alan Menken (Disney Beauty and the Beast, Aladdin, Sister Act, The Little Mermaid.) If you love rock and roll, you’re going to love our big summer blockbuster musical which, this year, is the Elvis jukebox musical All Shook Up! Loosely based on Twelfth Night it features a dynamic score of all the Elvis hits and a riotous script - don’t miss it! For Dance lovers, Marlisa Ross brings us two fantastic productions. Firstly, a dark re-telling of the tale of Pinocchio from Dance Theatre 16+yrs and then, from our youngest dancers, a Roald Dahl themed show, as always, telling stories from a different perspective. There’s plenty to look forward to for live music fans too. The latest Wired for Sound cabaret night, with a school disco theme, takes to the stage in April, with our Gospel company returning onstage in June! Don’t forget our Wee Stars who are back in June with another devised show about the Grinch who stole the sun in Here Comes The Sun and our Easter Camp in April, which this year is based on the recent new Mary Poppins movie. Something for everyone… with arts at the heart! At Centrestage Enterprise we love to create! Not just staff uniform and t-shirts for customers, but costumes and props for shows, bags, badges and mugs for our ever expanding Centrestage communities! We also accept orders from outwith Centrestage offering competitive prices for personalised mugs and t-shirts.